Learn to Sketch With This Great Resource. We learn to sketch through practice and observation. If you want to learn how to draw but lack confidence or time to spare you can learn by following lessons on this site and similar sites you will find through links scattered in my pages. I carefully evaluate other sites and only link to them when I think they are worthwhile and not crammed full of affiliate links and dodgy products. Books and ebooks can also help. I have probably more than forty useful art books and ebooks I have learned from to one degree or another. From time to time I will add reviews of books I have gained a lot from and think will be helpful to you. The How to Sketch Guide is a 97 page downloadable pdf written by Kerry Godsall. The good thing about this ebook is the warm atmosphere Kerry creates throughout. This is an ebook written for absolute beginners. It starts with basic information about sketching tools and materials and then goes on to encourage the reader exactly how to start drawing in an ordered logical manner. It is not a step by step guide taking the reader through many stages of drawing but rather an encouragement and organizational tool with a collection of shorthand methods to help you convey movement, mood and tone quickly and confidently. 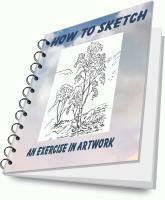 Kerry has also provided four free ebooks to download when you buy her How to Sketch Guide. BOOK OF ILLUSTRATIONSIllustrations to copy and study. For those of you that like specifics here are a few of the areas the How to Sketch Guide covers.